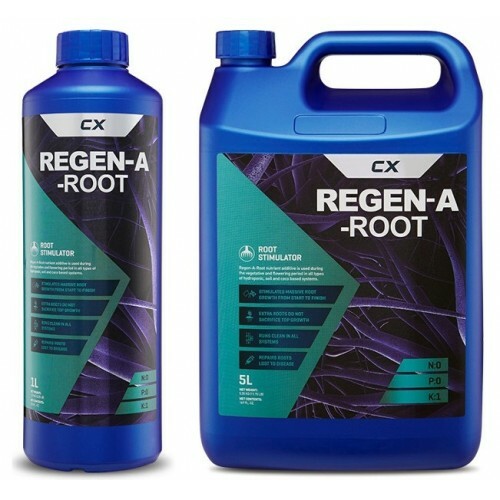 Canadian Xpress Regen-A-Root is a hormone free root growth tonic that ensures healthy root development and maximum nutrient uptake during all phases of growth and bloom. Regen-A-Root stimulates monster root growth while boosting the naturally occurring immune defenses of plant root systems. Instead of containing rooting hormones, Regen-A-Root contains the required precursors for naturally occurring plant Auxins. This approach guarantees phenomenal root development without sacrificing top growth, making it safe to use throughout both vegetative and flowering stages. Regen-A-Root is designed to work throughout your plant’s entire life cycle and not just the vegetative period, stimulating MASSIVE healthy roots that just don’t stop growing! Can be used in all types of hydroponic, soil and coco based systems a lush, healthy, productive root system every time is CX Horticulture’s guarantee to you.